Red Leaf is more than just a website, it’s an entirely new way to leverage your Epicor Prelude information. 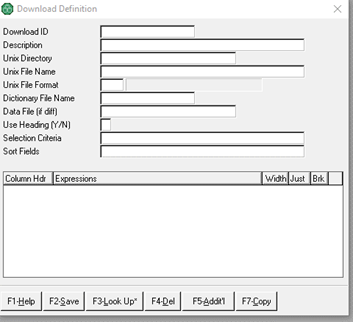 Fitting seamlessly into any SB+ application, the Download Definition tool provides developers the ability to rapidly and effortlessly export information to PowerBI, Excel, or others in a variety of formats. From tab separated values to commas, vertical bars to any format you can imagine, this tool provides the foundations for getting information out of your application with the least amount of time or effort. Without this tool, developers can easily spend hours manually creating each data export program. To import the extracted information into PowerBI can take even more time. Not so with the Download Definition tool. Create a definition with the tool and run it to bring up the information in Excel, and do it all before you finish that first cup of coffee. Unform is a powerful collection of tools for dramatically improving the presentation, archiving, scanning, and retrieving of printed and emailed documents. Combined with VSIFax, Unform can also be used to send documents to customers using the powerful Esker Fax-On-Demand service. Why buy separate expensive applications when one affordable one will do? For more information, see www.unform.com. VSIFax Fax-on-Demand is a comprehensive, multi-platform solution for faxing documents from your Multivalue application without the hassle of on-premises hardware. See www.esker.com for more information. Nakivo virtual appliances automate backup and recovery, freeing you up to work on important projects while remaining confident you can recover from the worst day imaginable. See www.nakivo.com for more information.